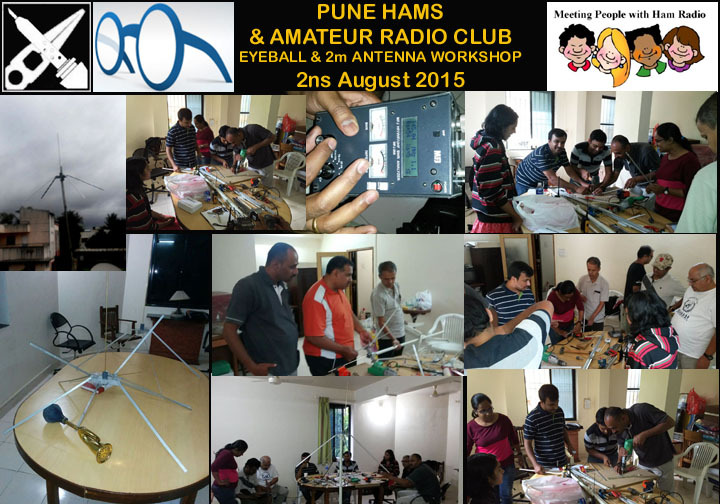 PUNE HAM and Amateur Radio Club (PHARC) eyeball QSO and Antenna Workshop on 2nd August 2015. It was an eyeball clubbed with a antenna workshop. We began with a discussion on Radio wave, Radio Frequency, Wave length, Resonation & Resonant frequencies. While explaining resonant frequencies VU2ASH/ Ashok Joshi used the example of resonation of sound in a dome. He then went on to speak about Velocity factor and velocity factor of transmission lines. The discussion then moved to Radiating elements of an antenna, Lobe formation of the radiated signals & Ground factor. Ashok spoke about 3dB bandwidth and cut-off frequency of an antenna. Evolution of antennas right from basic half wave dipoles to full length quad antennas were discussed. He explained why a Dipole works best when hoisted at least lambda by 4 from the ground. Ashok then went on to explain about Termination of an antenna & its resonation, about feed point impedance and the need for Matching networks & baluns. While discussing impedance, Ashok used the example of Dipoles that have a 75 ohms impedance and how when the ends are brought down to 120 degrees to form an Inverted V the antenna impedance drops down to 50 ohms and elaborated on how the impedance of the antenna changes according to its shape. There were various types of 2m home-brewed antennas that were on display which included a ground plain antenna, a vertical dipole, 3 element tape yagi, a aluminium 3 element yagi antenna with a matching unit, a 3 element quad & a TV ribbon cable slim jim antenna. We first tuned the yagi made out of measuring tape with the help of a antenna analyser. We stopped briefly for a working lunch that included McDonald’s veg burgers, french fries, lots of Coke some Ice cream with chocolate topping, Kiwi fruit pastry. After lunch till late evening we went on to construct and test 3 new ground plain antennas. In all a very fruitful exercise. [02/08 21:34] Mohan Paralkar VU2MMJ: Dear PHARS team today was an excellent session n practical workshop for the members special thanks Ashokji n Udayaji for guidance for us..
[02/08 23:00] Udaya Patil VU2UPQ : The workshop was excellent. It was very energising to see the enthusiasm & participation of each one who attended the workshop. It was a learning process for each one of us. Many Thanks to Swati, Monica, Vinayak, Devendar, Amogh, Mohan, Sailesh, Kushal for participating & to you ASHOK / VU2ASH for your guidance support & participation & for the input session. ‪[02/08 23:16] Ashok Joshi VU2ASH Thanks everyone . your eagerness and enthusiasm to do something was exceptional. Want to start preparation for amateur radio license as soon as possible. In merchant navy by profession, hence being excellent in radio communication a big plus. Want to study and acquire license before dec 2015. 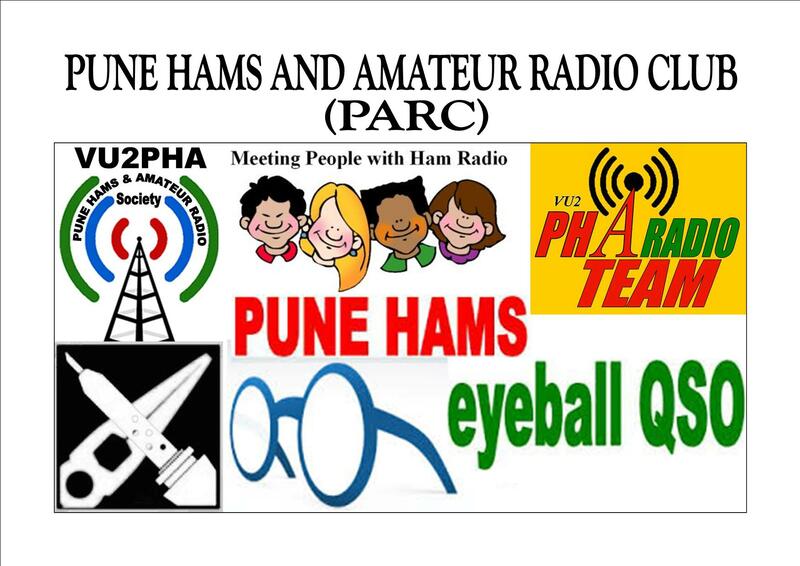 Please let me know where the PUNE HAM and Amateur Radio Club (PHARC) is located and how to join. Hello Neeraj, glad to know about your interest. I shall contact you over email. I am interested in HAM ever since my college days. I have been procrastinating this a lot. I would love to have some information on how to get a license in Pune. Hoping you will help. Welcome to this hobby. Ill be glad to help you. FYI, I had procrastinated over this for almost 10 years before I got my license.. Its a hobby .. so .. happens..
BTW, check your email and lets get in touch! First of all i would like to thank you for being generous and helpful in providing all the information about hams operator classes and other amateur radio related information. I checked out your webpage and i really appreciate your efforts in keeping it up with good information. Myself, Project Manager and Freelance Web Developer staying near Khadakwasla, looking forward for amateur radio license and have started preparing on my own. But i think it would be great to join some classes for AOSC and understand things in better way from some professional’s point of view. Can you please guide me regarding any such classes or amateur radio clubs conducting classes and exams ? Please check your email. Welcome to the hobby! I am interested in learning Ham Radio operations and would like to obtain a license. Please send me your contact details at the earliest. Just replied to your email. Welcome to Amateur Radio! Can I get more details on where the training is held. I need to be part of this. Hi Parag. This is not a training but a workshop. I have emailed you for further discussion on this. Really Appreciating your efforts for making this Amateur Radio more popular. 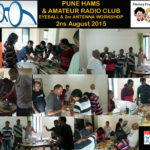 I am a working professional in Pune, please guide me how to obtain license and about HAM Radio Club in PUNE. Thanks, and welcome to the hobby! check your email. I am Disaster Management Volunteer of AADM (//www.aniruddhasadm.com/), as ham radio is very helpful in rescue activities, I am really interested to obtain license. Glad to know that you want to be a HAM. you dint mention where you are located. I have sent you an email. do let me know and I will try to help you. I am really interested in becoming a ham. I would really appreciate it if you can share when/where the workshops are conducted in Pune. Also, are these advanced level workshops? I am newbie. Glad to you know your interest, please check your email. HI I am Prof. Aniket Garud I would like to make my students team for disaster management plz give your contact details. Hi Aniket, I guess you have met our team already in this month’s meeting! Welcome to the hobby! @Abdul, I have added your email ID to the mailing list. Somebody from our group will send you an invite for the next meeting. 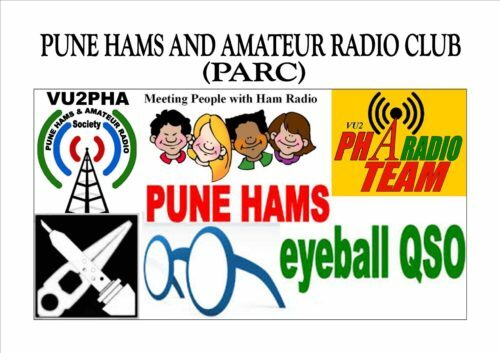 Do join the Pune Hams and Amateur Radio Club FB page for more updates. First of all i would like to thank you for being generous and helpful in providing all the information about hams operator classes and other amateur radio related information. I am staying near Pashan, looking forward for amateur radio license and have started preparing on my own. Thanks for the kind words! I am sending you an email with more details about your queries. There is an event on the coming Sunday (ie on 15th Jan 2017) at DSK Vishwa, Dhayri, Pune. About 30 Hams are expected to meet there for an activity called Fox Hunt organised by our club PHARC. 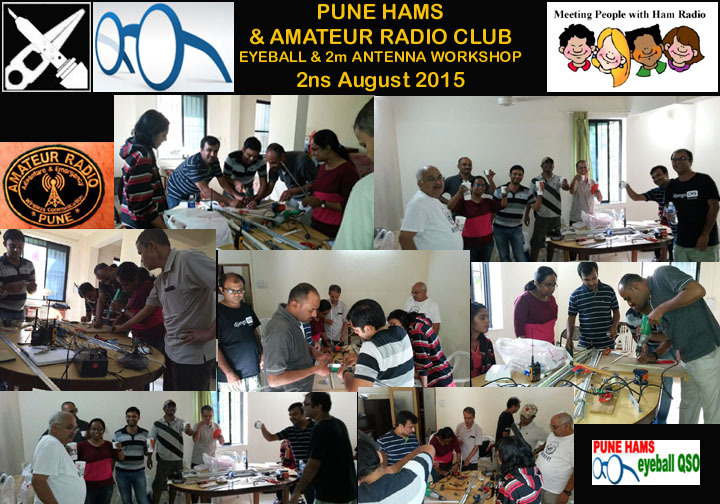 Almost all our workshops are targeted towards people with minimal or no exposure to Amateur Radio. So you will fit in perfect. More info on the FB page. Leave a message on the FB page if you need any further info. Hope to see you at the event! I am interested in HAM since my school days, please share information on workshops planned in pune. There is an event on the coming Sunday (ie on 15th Jan 2017) at DSK Vishwa, Dhayri, Pune. About 30 Hams are expected to meet there for an activity called Fox Hunt organised by our club PHARC. More info on the FB page. Leave a message on the FB page if you need any further info. Hope to see you there! There is an Meeting on 1st Sunday of every month (ie on 5th March 2017 next) at either Camp or JM road. 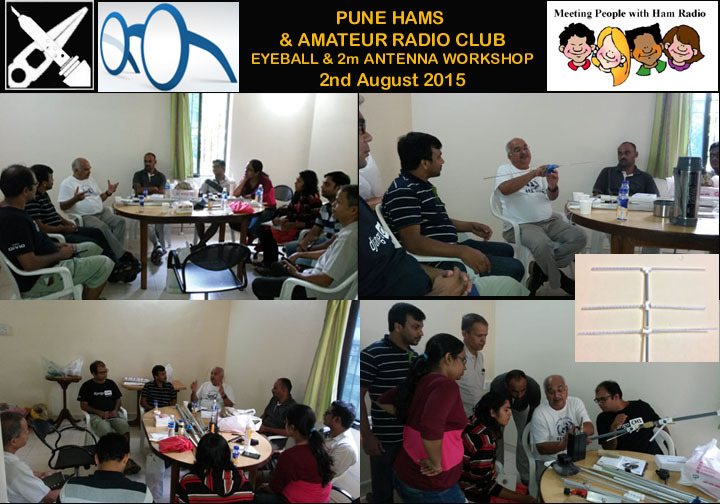 About 30 of us from Pune Hams meet every month and discuss about the hobby, or do workshops or other events. You can like the FB page and visit it to get the schedule updated regulary. I am interested in learning Ham Radio operations and would like to obtain a license. Please let me know, when is the next session planned in Pune. Also if you share the details on what are the pre-requisites to get into this area, that will be much helpful. PHARC is a group pf Pune Hams. I am a member. We conduct a monthly meeting. 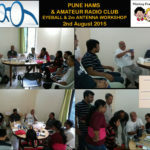 Please check the FB Page of Pune Hams and Amateur Radio Club (PHARC) and post your queries on the Page message box. I am always interested in HAM radio since my college days but didn’t had time and resources. Now I want to nurture my hobby before it’s too late. Please let me know how to proceed.